Ocean Liner memorabilia including menus, photos, tickets etc. #303 Vintage Ocean Liner Luggage Tag ! These old travel luggage tags are neat! 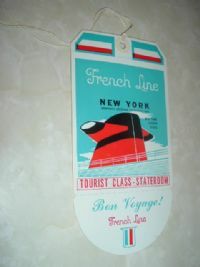 Included here is an original French Line Tourist Class Stateroom Luggage Tag. It measures approx. 4" x 7". The front features an cool view of the liner smoke stack. The front reads "French Line New York London Paris, Tourist Class Stateroom, Bon Voyage , French Line". Back is printed with spaces to enter the steamer date, destination , pier, deck, room etc, but is unused. Condition is near mint as shown!